So far Bell Punch's strategy in developing the ANITA calculators had been very successful. As the journal "New Scientist" reported in 1972: "Considering non-programmable calculators, Sumlock Comptometer was easily the largest UK supplier in 1971, with sales estimated at about £4.5 million." "In 1972 Rockwell, the American defence company, approached us with an offer to put all our calculator circuitry on to one chip. Previously we had always bought from British suppliers because of the need to keep close technical back-up of these suppliers in a high-tech industry. It was a change of policy which was to prove fatal. Development was started and the prototype of a pocket calculator was produced, the ANITA 800. I was then chief engineer of Sumlock Anita Electronics and Norman Kitz was technical director of the Bell Punch group. He came into my office looking very shaken and put the prototype pocket calculator on my desk and asked what I thought of its sales potential. I said that I thought that with good production engineering we could get the cost down to about £25 and sell a million on the home market and the sky's the limit for export. 'Yes I agree with that John' he said, 'I have just shown it to our M.D. and he can't see a market for it'. The prototype was fully engineered and could have been in production in weeks, but it lay in a drawer of Kitz's desk for months. Then Clive Sinclair brought out his pocket calculator. The sales director rushed into Kitz's office in a panic asking what could we do about it. Kitz opened his drawer and said 'We can do this'. The calculator which caused panic at Sumlock Anita Electronics — the Sinclair Executive. It was not the first electronic pocket calculator (that honour is normally given to the Busicom LE-120A "handy", made in Japan using American electronics) but its revolutionary design allowed it to be much thinner than any other, and made it the first shirt-pocket calculator. For more details of early hand-held calculators visit the Vintage Calculator Web Museum. A side view of the Sinclair Executive shows how thin it is, and for the first time allowed the use of button cells as the power source. The ANITA 811 went into production and spawned a series which was very successful. But Sinclair took the lion's share and got the credit and the knighthood. After years of successful innovation, maintaining the company's market leadership it was our biggest disappointment. We were certainly not in decline. We had in development accounting machines which were the precursor of the PC systems in use today, and we had started to "electronicise" the other products of the company: ticket machines, parking meters, mass-transit cash collection systems, coin recognition, coin counters, totalisators, taximeters, and others. However our engineering vision was not matched by our management's vision. Rockwell was hungry for commercial diversity and in 1973 bought Sumlock Anita Electronics from Bell Punch. Kitz and I stayed with Bell Punch for whom we had developed other electronics products." Given that threequarters of the 1972 downturn in Lamson Industries [the parent company] engineering activities from a £1.1m profit to a £290,000 loss was due to the calculating machine interests, yesterday's sale to Rockwell International eliminates last year's trouble spot". And: "Lamson Industries has sold to the American Rockwell International for an undisclosed sum its three electronic calculator and accounting machine subsidiaries. These Lamson subsidiaries, Sumlock Comptometer, Sumlock Anita Electronics, and The Ruf Organisation, lost money in 1972". Previously, in 1972, Rockwell had bought the semiconductor manufacturer American Micro-systems Inc., of California, which had moved into calculator manufacture under the trade name Unicom. "It was during this period of the Company's development that our horizons were broadened. We commenced work on an electronic 'billing' machine which combined a Triumph Adler electric typewriter with an LSI calculator together with a considerable amount of electronics, all housed in a custom-designed desk [see the Anita Business Computer]. Our use of Triumph Adler typewriters in our billing machines probably played a part in bringing the two companies together. Triumph Adler was an old-established company in Nurnberg, Germany, and was very much like the Bell Punch Company, both in the general appearance of its buildings, the sort of products it manufactured, and the fact that it was now venturing into electronics. However, instead of producing their own calculators, they were getting other suppliers to manufacture them to their own specification, and with their own Triumph or Adler label. They were getting them from Japan where electronic desk calculators were now in production. It so happened that Rockwell International, who had been a major contributor to the American Space Programme, were having to diversify due to cut-backs in the Programme by the American Government. They decided to invest in commercial enterprises such as televisions and power tools to name just two. They also wanted to capitalize on their microprocessor design and production capability and approached the Company with an offer to supply calculator 'chips'. The decision to purchase calculator 'chips' from Rockwell coincided with an approach by Triumph Adler to produce a handheld calculator for them and I was given overall responsibility to oversee the mechanical design, printed circuit design and final production to meet the Triumph Adler specifications. The availability of Rockwell chips meant that the amount of electronics in the handheld calculator would be physically minimal. Nevertheless, there was more than is found in the pocket calculators of today. The power arrangements alone were very comprehensive. It was to be powered by three 1.5 volt disposable batteries, or three rechargeable batteries or by a mains power supply via a separate battery charger which was to provide both the recharging and the mains supply facilities. Once again the keyboard switching arrangement was to our own design and comprised gold plated wire contacts soldered into the keyboard printed circuit relative to each function key, together with a network of spiral 'bell-pushes', which, when depressed by the individual keys, made contact with the wire contacts. The network of spiral contacts was etched from stainless steel foil, gold plated and soldered directly to the keyboard printed circuit. This keyboard switching arrangement was successfully developed and was used in all our subsequent calculators, including larger desk types. Although we had set up a pilot 'Nixie' tube production line, and an experimental liquid crystal display design facility, we had nothing of our own design for our hand-held calculator and had to utilize a small 9-character Light Emitting Diode (L.E.D.) display manufactured in Canada. Triumph Adler had their own particular 'livery' for all their calculators with which we had to conform. The casework had to be black; 'Number' keys grey with black numbers; 'Clear' key orange; 'Minus' key red; 'Plus' key blue and the remainder black. 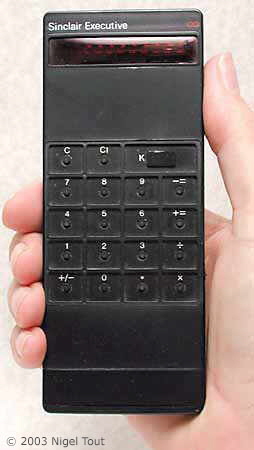 The calculators were to be sold in some countries with the name 'Triumph' and in others 'Adler' and this was catered for in production according to order requirements. We also provided the cartons for each individual calculator printed to conform to Triumph Adler's corporate style of lettering and colour. And to simplify matters, we also shipped the calculators to T.A's customers and agents worldwide. Coincident with finalising T.A. 's requirements and setting up the production facility in our factory in Portsmouth, we also put our own requirements into production. Basically this only involved settling on our own colour schemes for the hand-held calculator. It was necessary for us to make it look different from the T.A. models because, in effect, we would be in competition with them in the market place. We did not involve John Barnes at all this time but in looking ahead, decided to recruit our own industrial/graphic designer, Alan Pittaway. The Anita versions of the hand-held calculators was the first job we gave him. Gunther Woithe was the Sales Director of Triumph Adler in Nurnberg and he made several liaison visits to Uxbridge during the design and early production stages in 1972 and 1973 and I made two visits to Nurnberg, mainly in connection with the provision of battery chargers. The first ANITA hand-held calculator, which incorporated a Rockwell chip. On the left is the ANITA 811 and on the right is the version made for Triumph-Adler, the Adler 81. The development of these calculators is described above. Then, suddenly, in 1973, our lives changed dramatically. John Drage, a Chief Electronics Engineer under Norbert Kitz, came to see me to tell me that we were being taken over by Rockwell International and that all senior staff were to go to London in two days time to meet the Rockwell executives. "However", he said, "Gunther Woithe doesn't know about this and he is out in Tokyo at the moment. The M.D. wants you to fly out tomorrow and break the news to him. It is not the sort of thing that should be done over the phone and it will give you the opportunity to search out some battery charger manufacturers". I flew out the next day and the following morning booked into the hotel where Gunther was staying. On his return in the evening I met up with him and gave him the news. He appeared visibly shaken and went off to telephone or Telex Nurnberg. The following day he was travelling down to Kyoto to visit OMRON, the electrical controls company who were also manufacturing electronic desk calculators. I accompanied Gunther to find out if OMRON were interested in making battery chargers for us. The outcome of all this was that our association with Triumph Adler began to fade and Omron began making hand-held calculators for T.A. which were remarkably similar in design and appearance to Sumlock's. On my return from Tokyo I found that Norbert Kitz and John Lloyd had left and rejoined the Bell Punch Company, John Drage had been appointed Director of Engineering and I had been appointed Technical Manager of the Company. Ron Higgin, the M.D. of the Bell Punch Company, had moved over and become M.D. of Sumlock Anita Limited. Rockwell International, in their bid to become a major force in the calculator business, not only purchased Sumlock Anita but also a small company in Cupertino, California, called Unicom. This company had apparently not been in the calculator business very long and were taking advantage of the availability of Rockwell's calculator chips and perhaps had started life under the Rockwell umbrella from the very beginning. Ron Higgin, our new M.D., said that I should go over on a liaison visit to Unicom [Rockwell had bought Unicom] in Cupertino and in due course I flew over with one of our electronic engineers, a software engineer and a product analyst from the sales side of the company. Cupertino is situated in what is commonly called 'silicon valley', some 30 to 40 miles south of San Fransisco. Unicom were occupying a section of a modern building but seemed to be operating on a shoestring with all of the design functions being carried out on one floor in an open-plan environment. Tooling and styling were sub-contracted and final production was carried out in Nogales just over the border in Mexico, where labour was extremely cheap. Back in Uxbridge we had designed and produced a prototype of the first of our desk calculators using a Rockwell chip. There was a general consensus of opinion, mainly on the sales side, that this calculator should have a rechargeable battery facility from the outset. It was therefore designed with an internal battery compartment and had a rounded back following the form of the batteries. Ron Higgin took an instant dislike to its aesthetic properties and it was shelved and I doubt whether a prototype of this model survives. Although the ANITA desk calculators that followed during the Rockwell era gave no indication of a possible battery facility through their exterior shape, the top and bottom case mouldings were designed internally to take batteries if the decision was ever taken [see the Anita 811 SL and the Anita 1211 SL]." Nick Law worked at offices in Haywards Heath and was involved with the integrated circuits that Norbert Kitz designed for the ANITA desktop calculators. He recalls: When Rockwell management took over Sumlock ANITA various Rockwell managers visited Haywards Heath and were somewhat surprised at the microprocessor development I had been involved in. Further development of hardware and software was halted, as the integrated circuits used were not compatible with those produced by Rockwell IC plants in the USA. Work on the ABC (ANITA Business Computer) was also halted, as it was not considered to be advanced enough for a new computer system. A friend who was working at Control Sytems later told me that all ANITA equipment was declared to be out of date and worthless, so was dumped. The first part of Sumlock to be closed was however the Haywards Heath office. Some of the former emloyees (myself included) used our redundancy payments to start an office in Haywards Heath, which continued to supply service, software and paper forms to customers throughout the UK. We then negotiated a contract with RUF of Zurich to market some new computer systems, made by Hermes in Switzerland. We also later became Commodore PET dealers! Up to now the the calculators had been sold around Britain by a direct sales force through branches of (successively renamed over the years) London Computator, Sumlock, Sumlock Comptometer, and now Sumlock Anita. However, the direct sales force was only accustomed to dealing with companies, and with the introduction of the low-cost hand-held calculators it was necessary to reach the consumer market. So, in a break with tradition, two distributors also took on the marketing and distribution of the hand-held calculators to the retail trade. These distributors were Fi-Cord, of Didsbury, Manchester, and Phytron Electronics, of London. … There are still too many suppliers in the pocket calculator business — especially in the £50 to £80 range — to allow any one manufacturer to achieve a major breakthrough in sales, and hence allow prices to be brought down economically. Instead the present competition has resulted in a price war, which eventually will lead only to fewer manufacturers being left in the market. Indeed the shake out has already begun. Last week, for instance, Lamson Industries Ltd sold its Anita division, the largest electronic calculator manufacturer in Britain, to the proprietor of its US supplier of LSI circuits, Rockwell International. This is, no doubt, a sign of the times." The assets that Rockwell bought from Control Systems were its business machines interests. This mainly included the calculator manufacturer Sumlock Anita Electronics Ltd., and the sales and service company Sumlock Comptometer which had a name change to Sumlock Anita Ltd. It acquired the Portsmouth factory, the R & D building in Uxbridge, and a sales and administration building, Anita House, on another site in Rockingham Road, Uxbridge. "The Times" gave details of what was proposed for the calculator business: "... the intention is to sell some of the Sumlock products in North America, and to market some of the group's Unicom calculators from the United States through Sumlock in Europe. The electronics side of Rockwell's business has been one of the fastest-growing in recent years. Starting with the supply of microcircuits to Japanese makers of electronic calculators [see the Sharp QT-8D], this moved rapidly into the production of calculators within the Rockwell group itself". Rockwell models were manufactured together with ANITA ones at the Sumlock Anita Electronics factory at Portsmouth, Hampshire. See the section on Rockwell-ANITA Calculators. A company internal memo of October 1974 lists the Rockwell calculator models that the company will be dealing with and says "For the first few months we will import machines from the U.S.A. but active steps are now being taken to ensure that production of this new calculator range will commence at Portsmouth early next year". Control Systems Ltd. continued in business with its other products, which included ticket machines, parking meters, mass-transit cash collection systems, coin recognition, coin counters, totalisators, and taximeters. Items on this page additionally copyright © 2001 John Sparkes, John Lloyd, © 2013 Nick Law. Beaumont, Tony, "Price war in the calculator business", New Scientist, 29 June 1972, pp748-751. The Times, May 5, 1973. Valéry, Nicholas, "Shopping around for a calculator", New Scientist, 31 May 1973, pp549-551. The Times, Seotember 19, 1973. "Information Bulletin: Pre Product Release Information, Rockwell Consumer Range, 10R, 20R, 30R, 51R, 61R", Sumlock Comptometer Limited internal memo, section 1.0, 29th October 1974.